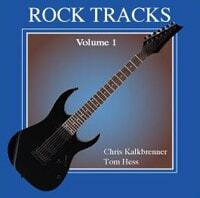 "Rock Tracks" - Lead Guitar Improvising CD, Contains 11 rhythm tracks with complete band in a variety of rock styles. The CD booklet insert contains instructions about what scales can be played over each track. Using the Rock Tracks CD will be a very important part of your lead guitar and improvisation growth as a musician! Everyone wants to be a star with their own professional band backing them up. Now you can, order the Rock Tracks CD today! If you enjoyed Rock Tracks Volume 1, then you will also find Rock Tracks Volume 2 useful.